Wouldn’t you just love a bit of sweet heat on your caramelized, roasted vegetables? 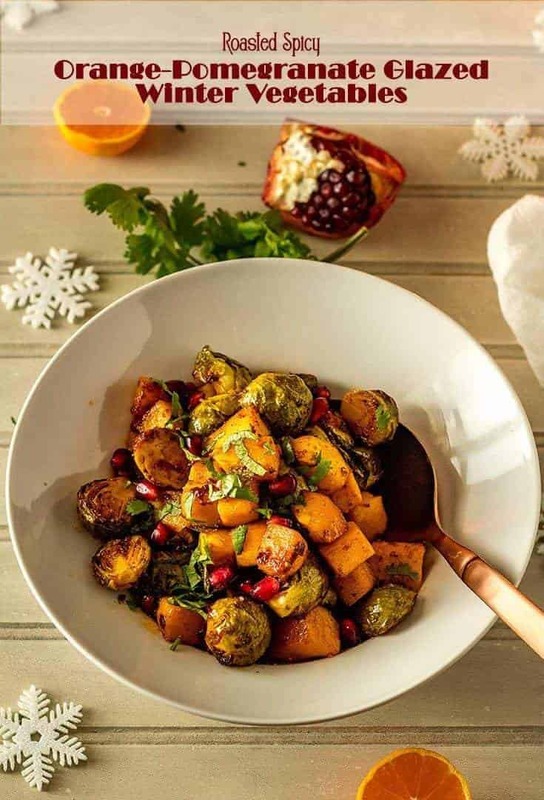 Roasted Spicy Orange-Pomegranate Glazed Winter Vegetables get tossed with a mixture that includes luscious pomegranate molasses, clementine (orange, blood orange, cara cara orange), a bit of maple syrup, and a chipotle chile in its adobo… Yes, its spicy-sweet coat will have you coming back for more! Eat more veggies! I had planned to call these lovely Roasted Spicy Orange-Pomegranate Glazed Winter Vegetables “Mexican,” but I wasn’t confident that would fly… The flavors and ingredients are definitely taken from the Mexican flavor profile: Chipotle chile in adobo, citrus, pomegranate, cilantro, garlic. I guess it depends on your chosen veg, but winter vegetables like butternut squash and brussels sprouts aren’t typically found in a Mexican market. You are likely to find zucchini and chayote squash, along with an abundance of amazing produce. At any rate, this girl uses flavor profiles to create new dishes. I love Mexican flavors, and they work really well as a glaze on roasted winter veggies! Interested in more info on Mexican produce? See The Fruits and Vegetables of Mexico and Rick Bayless: It’s Time to Give Vegetables Their Due in Mexican Cuisine. Roasted Spicy Orange-Pomegranate Glazed Winter Vegetables is a side that I created to accompany the Festive Mexican Cornish Game Hens and Mexican Cilantro Rice in my Cozy Christmas Menu for Two in 2017. One of the challenges I’ve faced since our move to McAllen, TX is in cooking for 2. This menu may or may not leave you with a small lunch the next day. We are pretty careful with portion sizes, so we do have a nice lunch the next day. If cooking for a small family is a challenge you face, I’d love to hear from you. Obviously, if this menu appeals to you, simply scale it up! Lastly, remember: Flexibility is key to becoming more comfortable in the kitchen. 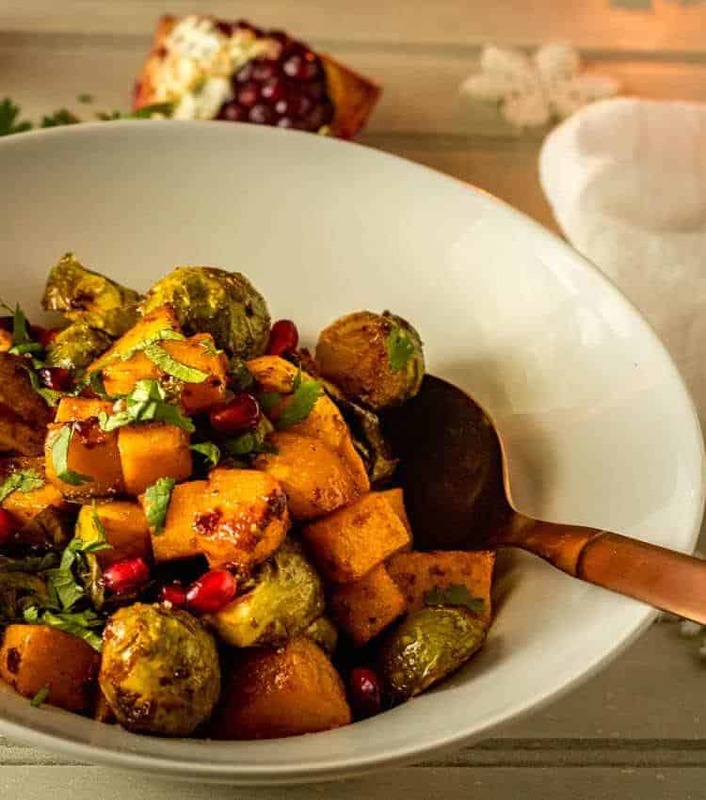 Don’t limit this recipe to brussels sprouts and butternut squash. Substitute your favorites, keeping in mind you may need to vary the cooking time. Sweet potatoes, delicata squash, pumpkin, green beans, beets, etc. would make great substitutes. Christmas at Andersen casa always focuses around the table. Precious time with our loved ones. We will be in Charlotte, North Carolina with our oldest son, his wife, our 2 little grandsons, our third son, and my sister. While gifts will be exchanged, and the littles will provide a lot of joy, what we look forward to most is celebrating our Savior’s birth, and preparing and enjoying a meal. Together. 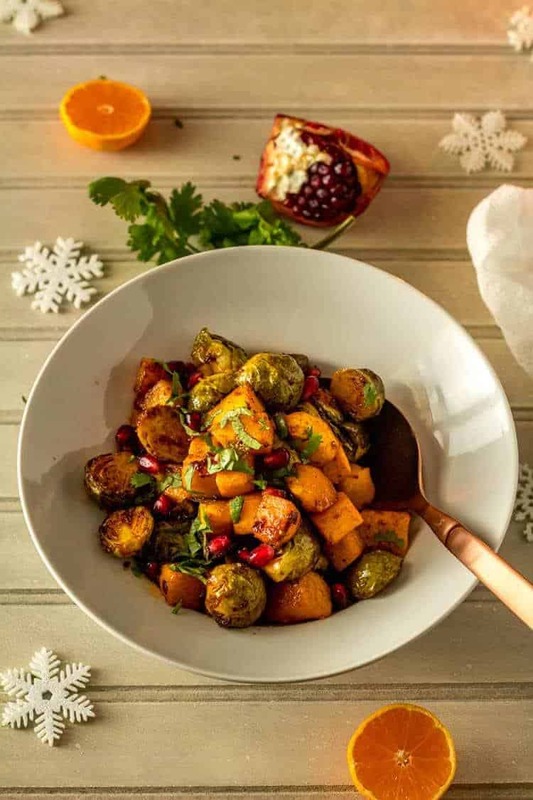 Winter vegetables get tossed with a mixture that includes luscious pomegranate molasses, clementine (orange, blood orange, cara cara orange), a bit of maple syrup, and a chipotle chile in its adobo... fantastic, healthy, south-of-the-border flavor! Preheat oven to 375 degrees (350 convection). Add first 6 ingredients to a personal blender or small food processor. Process until very smooth. Add the prepped root vegetables to a mixing bowl. Pour the glaze over, and toss well to combine. Season with several grinds of pepper. Spread in a single layer in a casserole or baking sheet sprayed with cooking spray. I prefer my thick unglazed stone ware pan. Cook in preheated oven until tender and caramelized on the edges, stirring every 10 minutes or so. I do a 3/4" dice, and they take 25-30 minutes in my oven. To serve: Garnish with pomegranate arils and chopped cilantro. Chipotles in adobo are dried and smoked jalapenos in sauce. They're spicy. We felt 1 small chipotle was perfect. If you can't handle heat, use a half chipotle or just a spoonful of adobo. Pomegranate molasses is widely available in international foods sections of many markets. If you cannot find it, reduce pomegranate juice. Macronutrients (approximation from MyFitnessPal): 161 calories; 5 g protein; 23 g carbohydrates; 7 g fat. 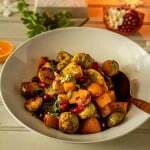 Roasted vegetables are awesome anyway, and the seasonings on this recipe take it to the next level. This looks awesome. Love the sweet and spicy! Was surprise to see Brussels Sprouts, a pleasant surprise. :) Happy Holidays! Thanks so much MJ! I don't do brussels sprouts often because hubby really doesn't care for them... I, however, love them! Have a wonderful Christmas!